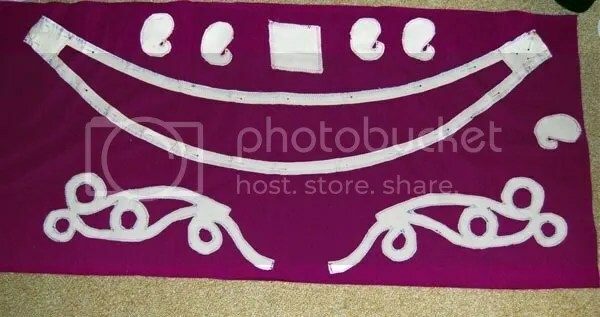 Covering the belt base seemed like an impossible task. With all the cut-outs, curls and corners, I was not looking forward to the process. Today I’ll show you how I covered the swirly part of the design. Start out by putting all your pattern pieces on the wrong side if your fashion fabric. Cut with a generous amount of seam allowance. I took the swirly pieces and stitched straight through the middle of the design, following all the curves. This is the easiest way to keep your fabric from sliding around when you’re pulling on the edges. Glue might work too, but I hate glue with a passion Seamstresses don’t glue stuff together if you can stitch it together! 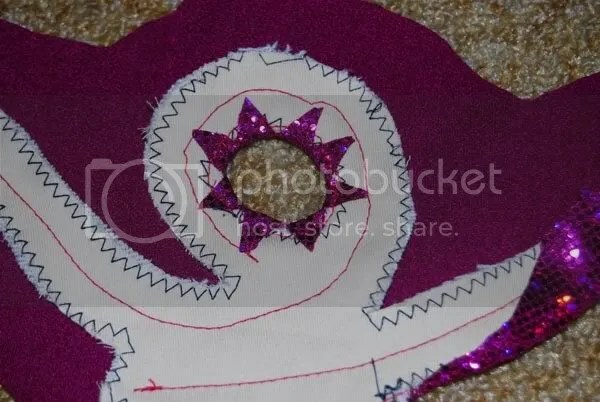 Do the same thing with the smaller, circular holes, but make an eight pointed star. Pin thoroughly and make sure you pull the fabric tght enough to cover the edge completely. Time to finish the outline! Reduce the seam allowance to about half an inch and cut incisions ever 2 inch. Fold fabric and baste.